This website NOW features over 80 areas in Northwestern Alberta and Northeastern British Columbia known as the Peace Country. 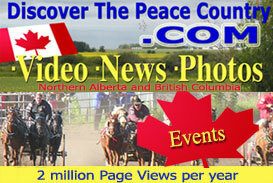 All of the Peace Country is now on ONE website with over 5,000 pictures/images on this site as well as 200 Local Videos. Each area can be accessed from the 4 pull down menus at the top of each page or by accessing the Map of the Peace Country or Map of County. These road maps are clickable...click on any area of the map and information and pictures comes up. Golden Star, Crown & Anchor, and MR. MIKES and many more. Canadian Motor Inn, Service Plus Inns, and The Lodge Motor Inn and more. Legal: Discover The Peace Country Ltd makes every effort to ensure the accuracy of the information on discoverthepeacecountry.com, but cannot be held responsible for any consequences arising from errors or omissions. Errors will be changed immediately with notification to this website by e-mailing the website contact. : info@discoverthepeacecountry.com All pictures/images posted on this website have been taken by Ken Connors (Chernuka) , unless otherwise stated, and is owned by Discover The Peace Country Ltd and is protected by Copyright law. Information from this website cannot be reproduced in any form. It is illegal to use pictures from this website on another website, including forums or blogs without written permission. Warnings of copyright are posted on every page of this website as well as the consequences of copyright infringement. All information on DiscoverThePeaceCountry.com written by Ken Connors including all the Photography and the creation of all web pages. Peace Country Website Climbs To The Top! A ONE-OF-A-KIND WEBSITE that features the entire Peace Country has quickly become one of the most informative websites in the northwestern Alberta and northeastern British Columbia. www.DiscoverThePeaceCountry.com has been online since May 2003, and has grown to include 70 areas of the Peace Country. This unique tourism website features cities, towns, villages, hamlets, parks and lakes, and networks them together for easy access. Each area of the Peace Country includes location, population, history, events, schools, accommodations, camping, golf etc. There are more than 1800 pictures on this website. There are also many links to hotels, restaurants as well as links to other informative websites. What makes DiscoverThePeaceCountry.com so unique, is that it is the inspiration and work of "one person". After approximately 6 years in the making, Ken Connors has donated 1000's of hours of his spare time travelling to each area, doing the research, photography and web-pages. "Years ago I had a vision of taking a map, and clicking on it.... and information would come up about that area. Many said it couldn't be done, so I ended up doing it myself", says Connors. There are a number of clickable maps currently on this website which gives one a virtual tour of the entire Peace Country from Grande Prairie to Rainbow Lake to the north, and Chetwynd to the west, and High Prairie to the east. Many communities have never been featured on the internet before, and are very pleased that Mr. Connors has taken the time to visit their community and put them on the internet for free. "I have thoroughly enjoyed travelling to all the communities, seeing many interesting sites as well as meeting so many friendly people". In August of 2004, DiscoverThePeaceCountry.com website was featured in the Vancouver Province Newspaper as one of the top 10 websites of British Columbia. "I am delighted that this site has reached this type of recognition", says Ken Connors developer of the website, pointing out that of the 70 areas on the website, 14 are from British Columbia. January 2011: Ken Connors takes on the challenge of working full time on DiscoverThePeaceCountry.com. Besides taking photos, and videos, he is now the salesman, ad designer, invoicer, accountant, photographer, video camera man, video editor, voice over person, writer, and person adding content to webiste. There are very few websites in Canada or North America that are able to generate enough income to maintain a business without a storefront business but DiscoverThePeaceCountry.com has been able to do that. DiscoverThePeacCountry.com has also become one of the most viewed websites in northern Alberta and BC and that has been achieved without any provincial or federal funding. Ken Chernuka was born and raised in the Peace Country. Born in Sexsmith, he received his education at Rycroft Alberta, and attended SAIT College in Calgary. (Radio, TV and Stage Arts). His alias became Ken Connors and was an on-air Radio Broadcaster in Grande Prairie (CFGP, later became SunFM and now Rock 97.7 FM) and Fort St. John, BC (CKNL) as well as other Radio/TV Stations in Alberta and Saskatchewan. (630 CHED Edmonton, 1140 CKXL Calgary, 1090 CHEC & CJOC Radio/TV Lethbridge, CJME Regina) See Kens Radio Scrapbook. After 10 years in radio and television, he switched to newspaper advertising sales (Daily Herald Tribune in Grande Prairie.) which ended in September of 2009, after 27 years. Developing this website is not his only internet accomplishment. 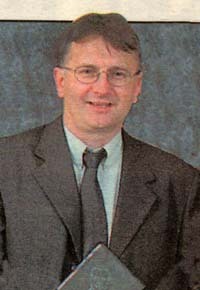 In 1999, he came up with more "original ideas" that bridged the gap between newspaper and the internet. "A Shopping Mall" and "How to put newspaper promos on-line" won him a National Award. His picture appeared in the Toronto Sun Newspaper June 24. 2001. (pictured right) Grande Prairie became one of the first newspapers in Canada to take this new internet direction. He was asked to speak to 130 newspaper publishers across Canada about his ideas, and at a seminar with 250 newspaper sales people. Parks and Lakes of the Peace Country, is a 28 page glossy brochure that features pictures and camping information on over 20 major campsites of the Peace Country. It also includes a map of the region and valuable information. This brochure was produced from cover to cover by Ken Connors of DiscoverThePeaceCountry.com (pictures, information, design and typsetting), who donated his time on this project. Printing of this brochure was made financially possible with the support of Leisureland Camper Village in Grande Prairie (14320-100 Street) . 10,000 Copies of this brochure were printed and distributed in 2006. ADVERTISE ON DISCOVERTHEPEACECOUNTRY.COM - Advertising Rates. It is really neat to know someone devotes so much time volunteering to do things like this. I did not think there was still people out there that give so freely of themselves. You are SPECIAL. I hope I can pay forward a titch of what you give of yourself. Congratulations on a job well done! It is great to read up on the histories of these small towns, parks, etc. Maybe it will entice people to do some day-trips to some of these areas and check out the history in our own backyard. I have looked at your web page, you have very nice photos of our area and the write up is very good. We appreciate your work to promote the Peace Country and the communities within. -Hythe. Can you answer some basic questions about your new website, discoverthe peacecountry.com? I would like to include it as an addition to another story about a website for the Grimshaw area? I appreciate the information you have on your website and will be a great tool when sending my employees to work in your area. I have book marked it. Great work, this looks great. I think this is a great idea. -County of Grande Prairie Council Member. Congratulations on the sites success thus far and the news coverage by local media is exciting. It must be quite rewarding for you to see the success of your hard work. I viewed your website shortly after the launch on May 1, 2003, was very impressed, and have recommended it to people making enquiries about the Peace. You have provided a much needed service to the Peace Country and an invaluable aid to development and tourism. Congratulations on a job very well done! Greetings! I looked up your new website and it looks really good. How industrious of you! It looks like it probably was a lot of fun to do, too. It is a good idea. We will be linking our website to yours. I will arrange for your site to be included under "Helpful Links"
You've done an excellent job on your site -Peace Wapiti School Division. I'm impressed with your website. With this new knowledge, I will make other agencies involved in business development in the region aware of your site. -Representative of the Government of Alberta, Grande Prairie. Hi Ken; We have added the link to your website to our External Links page under the category "Other External Links in our Community".